The Massachusetts Budget and Policy Center, in a paper titled “Skills For Our Future,” reported that while a career, vocational and technical education (CVTE) costs about $5,000 per pupil more than a traditional high school education each year, good CVTE programs can boost college attendance and career earning power. 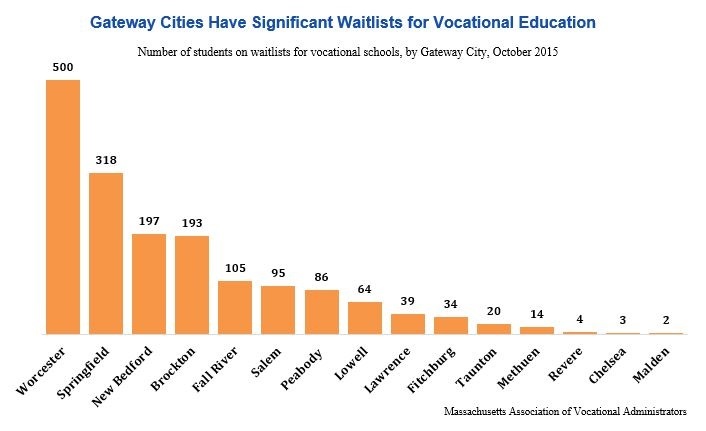 The 28 regional vocational schools and nine in-district vocational schools in Massachusetts serve about 48,000 students, equal to roughly 17 percent of the statewide high school enrollment, MassBudget said. CVTE enrollment has climbed about 14 percent in the last decade, from an enrollment of 42,000 in 2005. An economic development law approved in August included $45 million to invest in equipment and training at career and technical schools. The Alliance for Vocational and Technical Education said the funding in the economic development bill will facilitate dozens of grants over three years. An initial round of grants in February 2015 awarded $9.3 million to 35 high schools, community colleges and vocational training providers, according to the alliance. In January, a group of business groups and others announced the formation of the Alliance for Vocational and Technical Education, bringing together organizations as varied as the blue chip Massachusetts Competitive Partnership, the interfaith Massachusetts Communities Action Network, and think tanks Pioneer Institute and MassINC to advocate for expanded access to CVTE programs. Former Lt. Gov. Tim Murray, now president and CEO of the Worcester Regional Chamber of Commerce, serves as a co-chair of the group.